A set of 11 freestanding lace crochet machine embroidery designs. It includes 5 FSL crochet squares with Christmas decorations, 1 FSL crochet corner and 5 FSL crochet border embroidery designs. 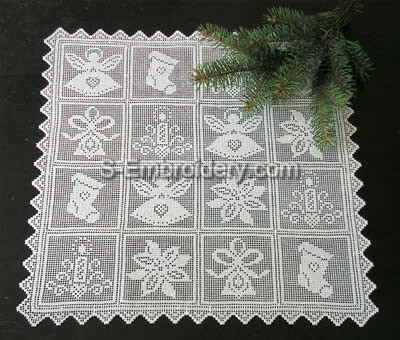 The set can be used to produce a nice Christmas doily or table runner. 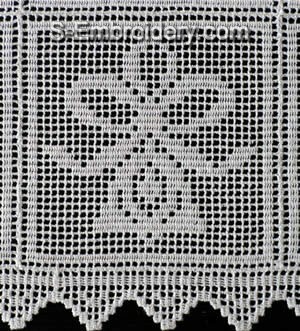 The crochet squares would also make fine decorations for pillow cases, curtains, tablecloth. Note: Images are available further down this page. 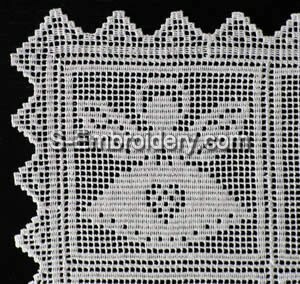 You receive 11 machine embroidery files and a PDF file with design information and instructions. A freestanding lace crochet square with a Christmas candle. A freestanding lace crochet square with a Christmas bell. 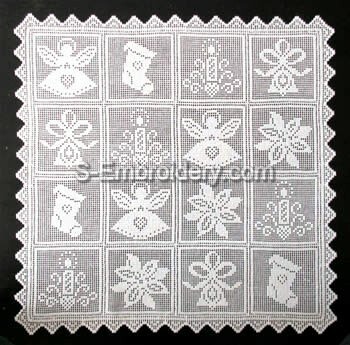 A freestanding lace crochet square with a Christmas angel. A freestanding lace crochet square with a Christmas poinsettia. A freestanding lace crochet square with a Christmas sock.